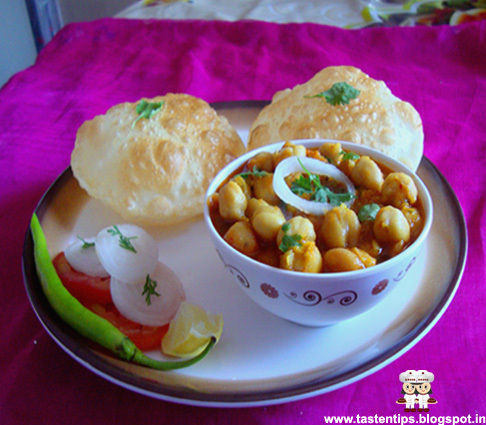 Chole Bhature is an extremely popular North Indian Dish all over India and abroad. 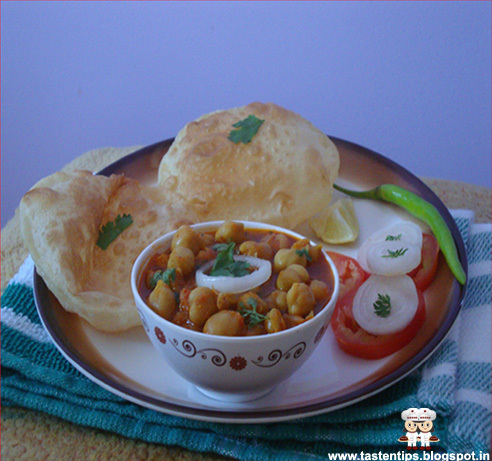 Chole Bhature is a made for each other combination and very versatile. you can get this dish at a five star hotel or at street food joint. It can be served as breakfast, lunch, dinner, a snack, at parties or festivals. 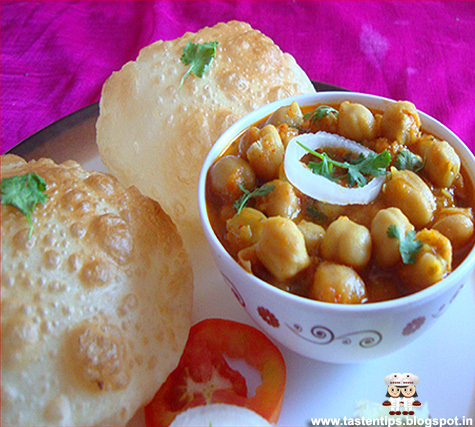 Chole Bhature is a spicy, tasty and delicious dish. Chole is a spicy curry made with white chickpeas, onion, tomato gravy, with a lot of Indian spices and bhatura is a crispy, puffed bread made with fine flour, both make an excellent combination. The plate of hot, spicy, chole with crispy piping hot bhature.....a thought is enough to get your taste buds salivating. 1. Clean, wash & soak chana in enough water over night. 2. Pressure cook chana with soda bicarb and water till done. and cook till light golden in color. 5. Add chopped tomato and cook till tomato become mushy. powder and cook till oil separates. mix well. Cook it till curry thickens. 8. Garnish with onion rings, coriander leaves & serve. 1. In a big bowl mix maida, semolina, baking powder, salt. 3. Make a smooth dough by adding enough water. 4. Cover it and keep aside for 3-4 hours. 5. Grease your hand and knead it well. 6. Divide the dough in equal portions and make a ball of each portion. 7. Roll each ball into a big size circle. 8. Heat oil in a pan, gently drop bhatura in hot oil. 9. Deep fry bhatura from both sides till golden. 10. 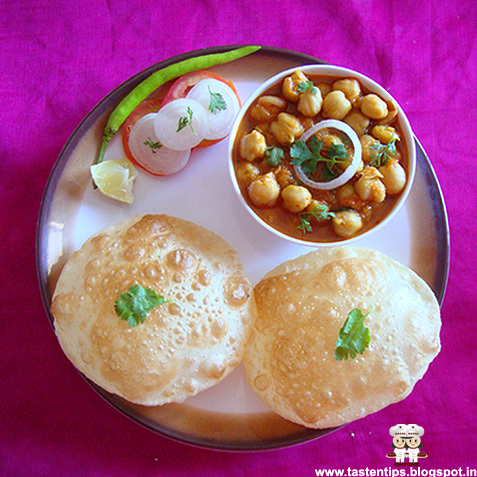 Serve crispy bhature with hot and spicy chole. 1. The raw bhatura should not be very thin or thick. bhatura will not get time to puff and turn dark immediately. 3. You can adjust the thickness of the chole gravy according to your choice. Looks super delicious and YUM! Perfect platter.. Looks just like a restaurant serving! Looks beautiful! This is an all-time favourite!